I had no idea what to expect from Stage Coach Sauces' Ruby Red Garlic Glaze. Through the bottle, it looked a bit like an Asian sweet chili sauce. 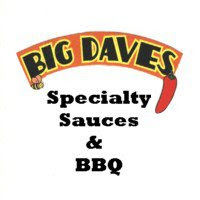 As the name would indicate, the thick sauce is grapefruit red and speckled with pepper flakes. The flavor of Ruby Red Garlic Glaze is difficult to explain. The first thing that comes to mind is a classic Italian salad dressing. However, that doesn't adequately sum up all of it's dimensions. In addition to a vinegar tang, there are also sweet and spicy elements. Katie first wanted to try the sauce on chicken wings. After baking up 3 lbs of wings, I tossed a dozen of them in the Ruby Red. The glaze was an interesting contrast to the other flavors (BBQ and Buffalo) we were using, but I just didn't feel like chicken wings were the best application for the Ruby Red Garlic Glaze. Next I decided to use the sauce as a glaze for plank grilled salmon. I grilled wild caught salmon fillets on cedar and cherry planks and brushed each fillet with the Ruby Red Garlic Glaze just before taking the fish off the grill. The sweet and tangy flavors of the glaze turned out to be a perfect match for the smokey salmon. The glaze adds plenty of flavor, but is still subtle enough to allow the flavor of the fish (and even the wood smoke) to come out. I still have nearly half a bottle remaining and I continue to seek out uses for this unique glaze. 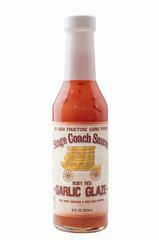 At this point, I can certainly recommend Stage Coach Sauces' Ruby Red Garlic Glaze for grilled fish, especially salmon. Check out the "Product Reviews" page to see how Ruby Red Garlic Glaze compares to other sauces. 0 Response to "Stage Coach Sauces' Ruby Red Garlic"
The "Q" Review joins Facebook!